Leaves of Grass. Washington, D. C. [New York, Electrotyped by Smith & McDougal] 1872. 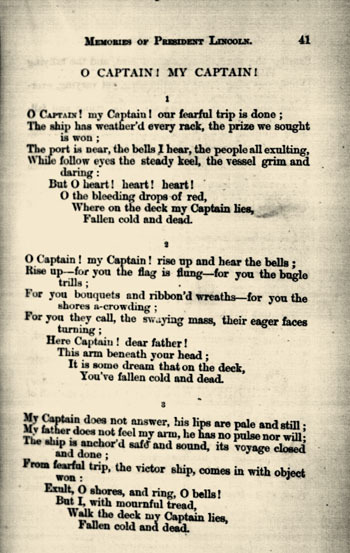 Written in 1865, on the occasion of assassination of Abraham Lincoln, "O Captain! My Captain!" is probably the most celebrated and recited poem by the Poet of America, Walt Whitman, and the most famous elegy written for the people's president, Abraham Lincoln.